Since I started teaching singing, I’ve been struck over and over again how much learning music is like learning a language. Music speaks in its own way – by learning to play our instruments we are learning the words and sentences that allow us to convey meaning. When we start to unpack notation, we’re learning to read (and write) all over again. We develop our ability to understand through listening to music, so we can appreciate and enjoy not just one, but many levels of music, just as in conventional language we learn to appreciate poetry of language as well as the message it’s conveying. These realms are often quite disconnected, like in the image. We do things which cover all of them, but we don’t think of them as all together. 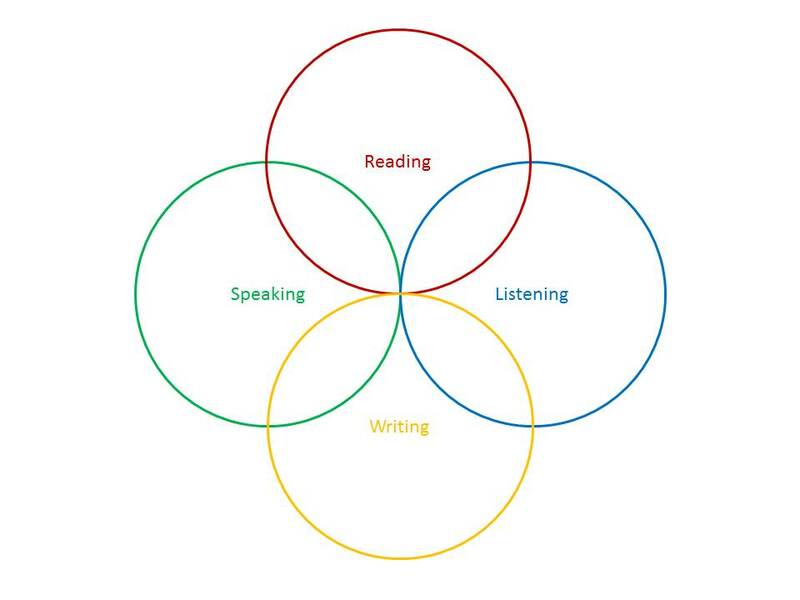 Schools take a lot of the burden of listening, but don’t do much with speaking or reading and writing. 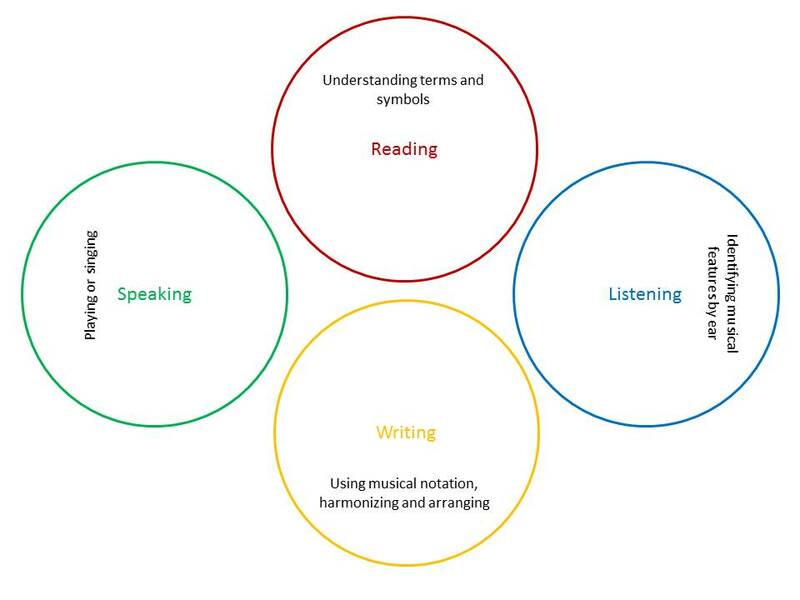 Private music lessons focus lots on speaking and some reading (playing from notation), but not much on writing. Well, until the dreaded Grade 5 theory approaches, and then it’s a crash course through the minimum to pass. It’s important to develop the relationship between all the different aspects of learning, otherwise vital skills, like writing down what you hear (or, dictation) get missed out! We want students to be able to do the skills in the in between brackets long before they go to conservatoire. Dictation isn’t hard, it just needs practice, as does sight-reading. Being able to identify differences between music as written v. as played might seem like a party trick, but it’s actually key to the kind of self-awareness that means students can fix their own mistakes both in playing and composing. I’m currently working on building a curriculum of musicianship for singers that takes into account all these different areas to make sure my students go out into the world not just able to sing, but as singers and musicians. 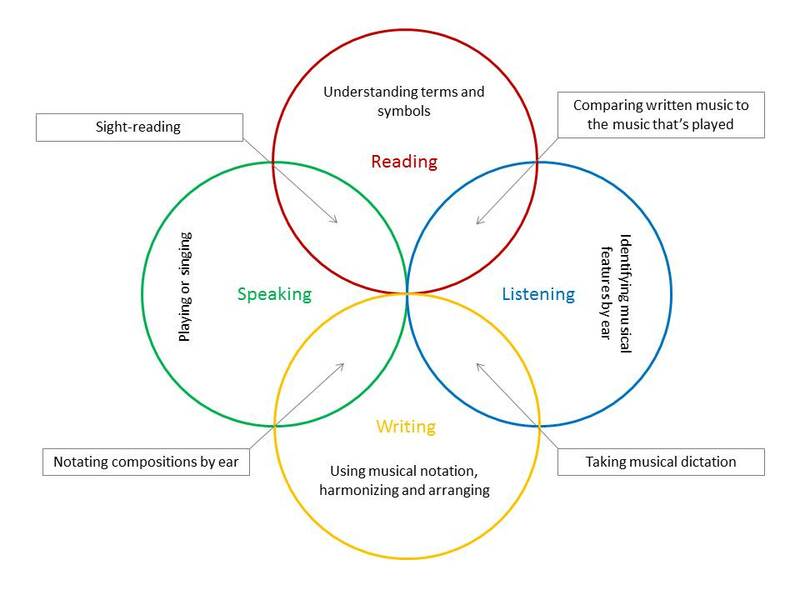 This entry was posted in Teaching and tagged aural tests, musicianship, simultaneous learning, teaching on 4th July 2013 by .